Colin Pantall and Joerg Colberg organized a collaborative community initiative to start the fall by asking a range of bloggers and online editors to select up to five photographers who "have demonstrated an openness to using new ideas in photography, who have taken chances with their photography and have shown an unwillingness to play it safe." Pete Brook of Prison Photography made a final post in the series a month ago and in his post he included a summary list of those participating and their choices. Historian, writer, and photographer John Edwin Mason replied to Brook’s tweet linking to the post by replying "The near absence of photogs of color is stunning" and that the lists of the participants as a whole "suggests, pretty strongly, that the blogosphere has a lot of homework to do." He labeled the lists "The Best White North American & European Photographers (with Minor Exceptions) of the First 1/8th of the 21st Century." I would respectfully suggest a one-word change to his reply. The near absence of photographers of color isn’t stunning, it’s unsurprising, and it manifests a number of problems in contemporary photography broadly and in online photography in particular. Let’s start a look at the issues with a straight question: does the absence of photographers of color on lists like this really matter? The arts, and photography in particular, help inform our thoughts and therefore images from artists across races and of different nations make us more aware of realties beyond our own. Without being presented a broad range of photographers and images, we have less specific knowledge of, and therefore take less consideration of, other spaces and people in our worldview and decision-making and limit our aesthetic experiences to a narrower range. So yes, it matters or - to put it another way - it’s problematic if work by photographers of color is not being recognized, especially by editors whose sites serve as a common gateway to broader exposure. Additionally, in a contemporary landscape devoid of an avant-garde and with our community having lost belief in a singular, linear direction in photography’s growth during the last decades, there’s probably a compelling case to make for hundreds of photographers for potential inclusion in response to the original question from all imaginable demographics who make all kinds of work. While I could understand an academic argument that says there are less than a half-dozen photographers working with truly new and original ideas in photography (or less...or none), I don’t think that type of extremely discerning and analytic list (and its potential to skew demographic parity due to very small sample size) was the spirit of Colberg and Pantall’s initiative. So...it’s important and plenty of potential choices were there to be made. Part of the answer lies in the list of editors who were initially invited to respond (I’ll just use "editors" to refer to all participants from now on for cleaner writing, although several probably consider themselves something else). It reflects their heavy concentration in or from the United States and Great Britain in particular. In turn, the lists the participants generated largely reflect the photographers and the parts of the photography world that they are most familiar with and surrounded by, both physically and online. They largely picked either universal names (Soth, Graham, Strauss) or made "local" over "global" selections. To a degree, making local selections that reflect the community of photographers and the parts of the photography world that we are most familiar with – usually the one we are surrounded by - is natural. I discovered during last years’ f100 series on this site that in order to broaden the list of photographers selected, I had to broaden the list of people making selections as much as possible. We know our localized worlds much better than the global world and it is always easier and more practical to pull from local areas one is already familiar with and knowledgeable about. It would have been a vast investment of time for the solicited editors to make a systematic global search for answers to the original question just for this initiative (more on this sentence below). When I put Colberg and Pantall’s question to members of a Spanish-language photography Facebook page that fototazo runs, for example, the responses overlapped generally with the editors on the universal names (Soth, etc. ), but were completely different on the smaller, "local" names – in this case heavy on Mexican photographers. Not coincidently, the majority of members of the page are Mexicans. It’s not that members aren't theoretically interested in North African or Chinese photography. It's that in a complex photography landscape defined by multitudes of local scenes, it becomes easier to talk about and reference universally known names on one hand and local names on the other. Knowing everything happening out there in the fractured and micro-oriented contemporary photography landscape isn’t possible. In addition, while photographers of color are obviously a vital part of the local photography communities in the United States and Great Britain, as well as in Western Europe, New Zealand, and Australia, they are significantly underrepresented in art schools, galleries, and the online photography world in relation to their general percentage of the population. The reasons why are outside the scope of this post, but might include, among other factors, discussions of access to arts education, the reflection of broader trends across the fine arts through history, economics and the relationship between fine artists and class, and the fact that whites have historically tended the gates of major museums and institutions. For this post, lets just say that the local worlds of the invited editors have a smaller number of photographers of color than they should in relation to the general population and their picks reflect this. 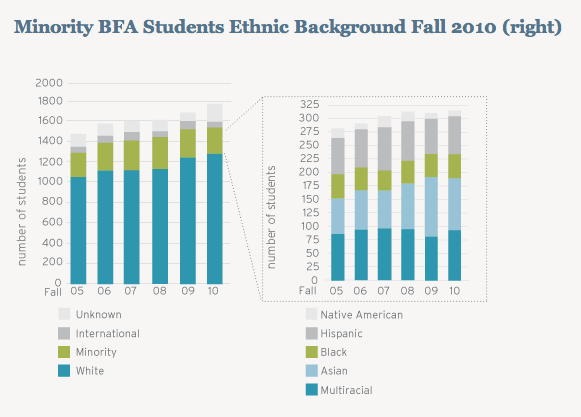 A random sample of the demographics of undergraduate art programs found online breaks down to roughly 75% white students, 25% students of color (see images below). This correlates to the demographics of the editor's selections. The fact that Mason’s tweets mention race, but not gender, underlines the idea that selections were focused locally and also correlates to the sample of demographic images I've posted here. Females make up over 50% of undergraduate art programs in the US today and subsequently gender parity is also increasingly a reality in galleries, in publications, and also in the selections made for this initiative. Relative local gender balance is reflected in the editors' selections and - this time in a positive sense – their selections made reflect the local demographic. In short, the selections made by editors reflect their local demographics in terms of race and gender. However, while that might make some sense, that's also the problem. While working locally is to a degree a natural response as I’ve suggested, a natural response is not always the best one, and in this case doing so is problematic and reveals a number of larger issues in contemporary online photography. If we include international photographers in the demographic breakdown of contemporary photography, photographers from beyond the United States and Western Europe, the percentage of photographers of color would obviously rise exponentially. The editors included in the initiative – myself included - deserve the collective comeuppance that Mason delivered for largely ignoring the broader photographic world in our selections. That oversight in our decision-making resulted in a skewed demographic representation of what's new in global photography today in our selections and a limited number of photographers of color that correlates to our local demographic instead. This is problematic not only because of the importance of exposure to the arts produced by artists from across races and nations as mentioned above, but also because of the role that the editors of major photography sites play. They serve a double function in online photography conversation. Their sites serve local conversation – geographically, but also in the sense of a limited number of people passing information between each other online. To some degree it can be argued that they should serve that local market. However, they also serve as the facilitators of international photographic conversation due to size, prominence, and distribution of visitors. Regardless of why we started our respective sites, with prominence and visibility comes power that also creates a degree of responsibility to serve our global audience in addition to our local one. A general awareness of international photographers is part of the job of the contemporary editor. To be blunt, the lack of diversity in this particular initiative flows from more general curatorial problems in terms of the search for and promotion of global photographic work. Most major sites tend to stay local, with the famous, or recycle names from other sites. A small group of photographers show up on most major sites, often times showing a new project on one site right after another. While some of the work deserves it, one could fairly say that blogs, magazines, and pages should do more "original research" in the sense of looking for and searching out strong photographers that come from beyond familiar sources and from other well-known blogs, sites, and pages. The end result of these curatorial tendencies can be seen in the lack of broader racial and cultural representation among selected photographers for Pantall and Colberg’s initiative. In a contemporary photographic landscape with no avant-garde or singular geographic center, it can also be argued that showing international work is a responsibility in order to properly report and assess the contemporary landscape. What is happening in Mumbai and Bogotá is as much a part of contemporary photography and as important as what's happening in New York and Paris. Broadening the work we present beyond the contemporary cannon of online all-stars and beyond graduates from MFA programs of the east and west coasts of the United States - which slant heavily towards white photographers and towards a narrow range of aesthetics - not only fulfills the responsibilities of power as international photography forums and guardians of international exposure, it also serves both our global and local audiences by presenting a range of images that will expand their understanding of what is happening out there in contemporary photography – and therefore in the world - today. Everyone wins, including the editors, who will be showing a broader, more dynamic, more aesthetically diverse range of images which creates a better product. This inclusion of global photographers on major photography sites is especially important today because visibility is also bringing online editors increasing power offline; they are moving beyond the internet to participate in real world initiatives, serving as conduits for photographers wanting to show work in the brick and mortar world, expanding the importance and the responsibility of their role in the process. 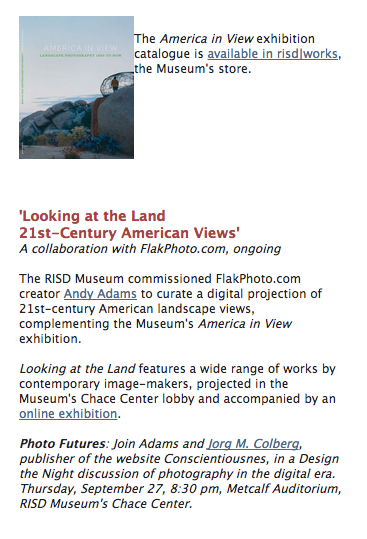 For example, editor Andy Adams of Flak Photo was recently hired by the Museum of the Rhode Island School of Design to curate a digital projection entitled “Looking at the Land” that is being shown alongside the museum show America in View. While the show has been reviewed a few times (and I will do so as well in the coming weeks), not enough has been made of the fact that Adams is at the forefront of the important movement of online editors into offline roles, a trend I believe will continue to grow as online magazines and blogs remain a cutting edge conversation and exhibition space for photography which is turned to by gallerists, curators, and others as sources for discovering new work and for following up-to-the-minute contemporary trends and conversation. As a creative and progressive community of editors with an expanding role, we can work to use the strengths of online photographic distribution to include international photographers, present a more balanced vision of what is happening in contemporary photography and improve our product for our audiences in the process. This particular initiative reflects our failure - so far - to properly do so. I said earlier in this post that it would have been "a vast investment of time for the solicited editors to make a systematic global search for answers to the original question just for this initiative." We shouldn't have been in the position to have needed to. We should be actively educating ourselves on international photographers and projects so that we are ready to consider them for initiatives such as this. Part II will be posted Thursday, October 25th.